Hey, Joe. How busy did Low and Slow keep you? Joe, you are simply amazing! Joe Faust goes Presidential and receives a letter from Rose Mary Woods. Yes: OK to print from my copyright! Thank you, Michael ! I've not seen those two letters since 1971. You can't copyright letters to and from the President of the United States. This one, however, may have been TOP SECRET. 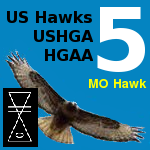 Last edited by Rick Masters on Sat Apr 14, 2018 8:02 pm, edited 1 time in total. Six feet eleven and a half inches was pretty good for 1960 as the world record at that time was by John Thomas (USA) of seven feet thee and three/eights. You were within four inches of the world record at the time. Awakened with the idea of USHGRS. "Do it!" "OK, I will." Joe's idea was warmly welcomed by some and harshly rejected by others. Joe, I just wanted to thank you for what you are doing. You sir, are indeed a treasure in our unworthy midst. On the flip side, Doug Marley, John Borton, Jack Axaopoulos, and a few others badgered Joe relentlessly in the hanggliding.org topic. Joe replied calmly and conststently over the span of 4 pages. Site "moderator", Jack Axaopoulos (alias "sg") rewarded the badgering by Marley and others by eventually banning Joe Faust on September 13th, 2018 ("Joe, you refused to take me off your list, so im taking you off of the orgs."). Axaopoulos deleted Joe's last post, changed the actual text of Joe's other posts, then locked the topic and flushed it to the "basement" to suppress any protests over his treatment of Joe Faust. 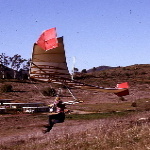 This particular hanggliding.org episode demonstrates the sickness that currently permeates significant portions of the sport of hang gliding. As "Swift" correctly stated, Joe Faust is indeed a treasure in our unworthy midst for his calm and consistent vision under such ruthless attack. Bill Liscomb mentions Joe Faust at the Smithsonian National Air and Space Museum in 2010. Joe is a hero to hang gliding and yet no one will speak against the injustice of his banning by Jack Axoupolous on hanggliding.org. I did and he deleted it. It may have been in the basement for a while but last time I looked I didn't see it. There may have been others but we wouldn't know because Jack can quickly hide them. We can't assume that I was the only one. I hope I wasn't.